Depending on your access you can subscribe to either the Admin Area calendar or the Member Area calendar. The Admin Area calendar allows you to subscribe to individual calendars where the Member Area calendar subscribes you to all calendar made visible to the Member Area. Navigate to Calendar from your Main Menu. From there, click the ‘Subscribe’ button. A new window will appear. Simply click on the respective link to subscribe. iCal / Outlook – would add a link into your Apple Calendar, or adds a calendar to Microsoft Outlook. 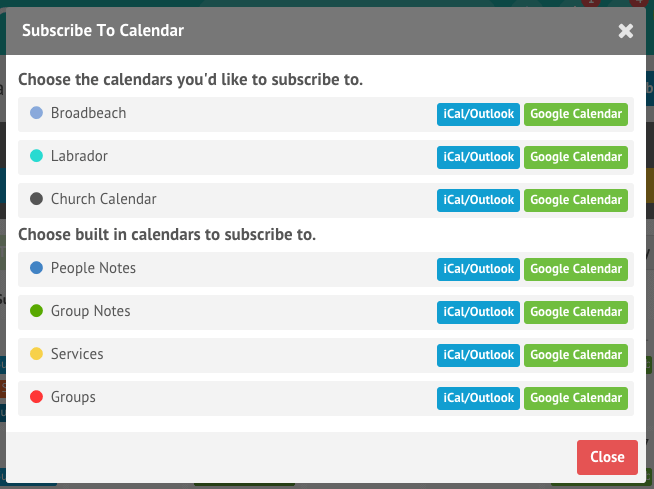 Google Calendar – adds a calendar to your existing Google Calendar. Navigate to the Calendar page in the Member Area. At the top right hand corner of the page, click on the ‘Subscribe’ button which will give you options based on the calendar program they use. For people who only have access to the Member Area, the ‘View Admin Calendar’ button is hidden from view.